How do companies avoid corporation tax? 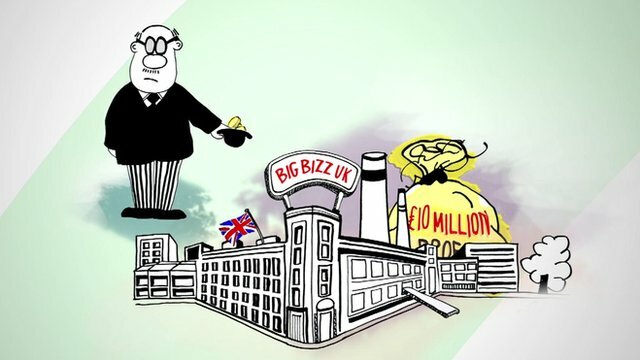 For a one minute explanation about how multinational companies can avoid paying tax in the UK check out this video on the BBC's website. I guess financial in the public sector boils down two things: getting the money as efficiently as possible and spending it as effectively as possible. My previous post was concerned with fraud which can lead to reduced income or wasted spending. This post focuses more on the collection of income. Or rather, maximising the amount of income to be collected. I suppose there have been people campaigning against this sort of activity for years but recently it must be resonating with the public mood and the issue has risen high up the public agenda. I don’t know why that would be. My take on it is that it is a corollary of the general public’s sense of unfairness—that they are paying for the bankers’ greed that caused the recession. They’re learning that not only have bankers been very well paid for causing this mess, they don’t pay their fair share of taxes. The public are receiving less public services, they’re losing their jobs (for example, the UK public sector has lost 22,000 jobs in the first quarter of 2013). Today has seen the launch of the Fair Tax Mark. Number 1 in their list of activities is to use the Fair Tax Mark methodology to publish credible assessments of whether large companies are acting transparently and paying fair tax in the UK.They have issued a report today on 25 of the UK’s top retailers, assessing only two to be awarded the Fair Tax Mark (see this article on Reuters). You can see the marks here. They have got the backing of Margaret Hodge, the chair of the Public Accounts Committee for their work. She hopes the impact on a company's reputation will act as a deterrent. Undoubtedly this sort of scoring and ranking will be criticised for its methodology, not just by the companies it ranks but by observers, too. Nevertheless, I think it makes a contribution to the overall debate. Just as there are increasing demands on government to be transparent to its public, this mark is assessing, in part, the transparency of the tax arrangements of the companies that the UK public buy from every day. For that reason I’m planning to keep an eye on its development over the next weeks and months. If you’re interested in more about this you can check out the Fair Tax Mark website and/or follow them on Twitter (@fairtaxmark). Today is 5 April, the final day of the UK tax year. It is unusual for an annual period to end on the 5th day of a month. I can’t think of any others. Generally, we like to use the first or last day of the month for defining periods—and this is especially the case with financial periods. Companies and governments are likely to use 31 December, 31 March, 30 June, etc as dates for the end of their financial years. In fact, as far as UK public sector bodies are concerned their budgets and statements of accounts use 1 April to 31 March as their financial years. So why does the UK government collect taxes on the basis of a year that runs from 6 April to 5 April? I am an accountant and I work as an interim manager through my own limited company. Without getting too technical about it, the potential for reducing my tax bill is not that great, not since the Inland Revenue introduced IR35. Prior to that people working through companies could pay themselves minimal salaries and take the rest of the money as dividends, upon which income tax is paid but not national insurance. Even with that device, you have to pay corporation tax on the profit before you can take the dividends. There are other possible tax advantages one could implement. Eg the company could employ the interim’s spouse or offspring and thus take advantage of two or more people’s personal tax allowances, reducing the interim’s total tax paid at the higher rates. Dare I say it, this is something MPs have been doing with office allowances for years. I think I should also mention the reason such companies are attractive to employers, especially for hiring interims: it reduces their liability as an employer. As far as the council or other body is concerned they have a service contract. That means they are not responsible for employment duties such as the working time directive, they don’t have to make national insurance contributions, they don’t have to pay for holidays, they don’t have to apply their equal pay scheme to the position, they can fire the person without having a long winded investigation and disciplinary hearing, and so on. They also don’t have to allow the person to join the pension scheme and thereby they can save themselves the pension contributions. The downside is VAT is payable on the service contract. Local government and ministries don’t worry about that because they can reclaim it from the treasury. The picture is different in the NHS and I’d be surprised if the witch hunt uncovered the same sort of arrangements in the trusts and PCTs. To see the full blog post and other comments go to http://welovelocalgovernment.wordpress.com/2012/02/20/interim-judgement/#comments.